This beautiful Jeff Cooper engagement ring features 3 round brilliant cut bar set diamonds on either side of your choice of a center stone. This setting is available in palladium, platinum, 18kt white gold or 18kt yellow gold and can accommodate a round brilliant or fancy shaped center stone from .40ct to 4.20ct. This beautiful Jeff Cooper engagement ring features a bar setting with 2 straight baguettes and 2 round brilliant cut diamonds set on either side of your choice of a center stone. This setting is available in platinum, 18kt white gold and 18kt yellow gold and can accommodate a round brilliant or fancy shape center stone from .40ct to 4.20ct. This beautiful Jeff Cooper engagement ring features four round brilliant cut channel-set diamonds on either side of your choice of a center diamond. 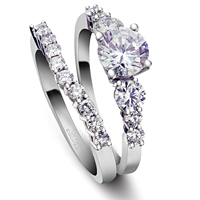 This beautiful solitaire Jeff Cooper engagement ring is perfectly designed to show off your choice of a center stone. This stylish Jeff Cooper engagement ring features channel set square emerald cut side diamonds which will perfectly enhance your choice of a center stone. Available in Platinum, 18kt White Gold or 18kt Yellow Gold and can accommodate a round brilliant or fancy shape center stone from .40ct to 4.20ct. 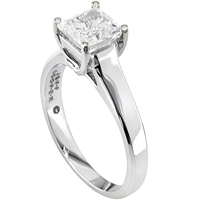 This stylish Jeff Cooper engagement ring features channel-set princess cut side diamonds and will perfectly show off your choice of a center diamond. This stunning three stone Jeff Cooper engagement ring features an emerald cut diamond set on either side of the center stone. This classic three stone Jeff Cooper engagement ring features a round brilliant cut diamond set on either side of the center stone. Available in Platinum, 18kt White Gold and 18kt Yellow Gold and can accommodate a round brilliant cut diamond from .40ct to 3.20ct. This classic solitaire Jeff Cooper engagement ring will show off your choice of a center stone perfectly. This beautiful Jeff Cooper engagement ring features three graduated round brilliant side diamonds on either side of the center stone.